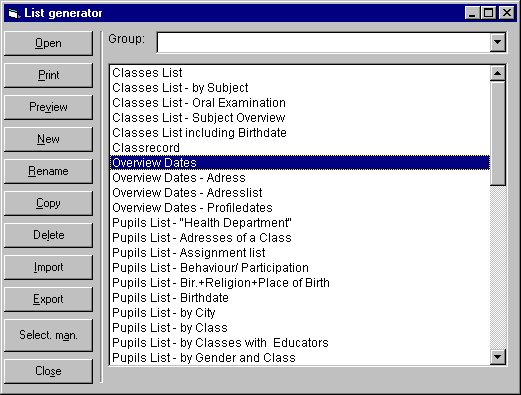 This is the window for List generation. For a description of the buttons please scroll down. : It will open a window to edit the selected List. : It will open a window to print the selected List. : It will open a window to get a preview of the selected List. : It will open a window to add a new List. : It will open a window to rename the selected List. : It will open a window to copy the selected List. : It will open a window to delete the selected List. : It will open a window to import List from database. : It will open a window to export List to any database. : It will open a window for managing the selected List .